A couple of months ago I noticed something strange; some of my tweets didn’t always show up in the twitter search. Quite soon it appeared that my hashtags were either not indexed or were omitted from the search functionality. Whenever I would click a hashtag to find it’s latest connected tweets I would never see any of my tweets. At first I thought that this might be some smart thing on the side of Twitter, where it would omit your own tweets from any search you would do. This didn’t turn out to be the case, however as it also happened when using a different system where I wasn’t logged in. I didn’t think too much of it, keeping in mind more search troubles with twitter that had been reported earlier this year. The fact that this also keeps me from being included in backchannels made me think after a while and I searched a bit more. Of course I was quick to find that inclusion in the Twitter search seemed to be a hot item in the Twitter help section, thus it did not take me too long before finding a bit more. A lot of missing tweets seem to be missing due to resource constraints, but as I’m a fairly active user and I’ve been active for more than a year this didn’t seem to apply to me. Being really active might be the underlying reason though. I checked out Twitter’s tips on missing tweets and found that they are also filtering on quality. Now this quality filtering might be the cause of me being blocked in Twitter. Of course; my tweets are often in Dutch, but that can’t be the problem. Instead I think it’s because of the way I use hashtags. 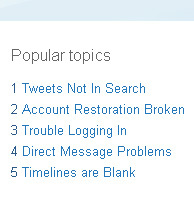 They are great to define a subject, so you can tweet with #db09 and appear in searches for the Dutch Bloggies. But the thing is, in “my” group are used for giving a context to tweets in a more varied way. Thus one could tweet “I really dislike these kind of things. #hamburgers”, thus indicating one adds to the ongoing hamburger discussion there. Even though I just tweet a lot of “general chatter”, I do not think my tweets are bad quality wise in a way that I spam products or websites or any other “bad” behavior. Instead it might be the hashtag thing; way more people tweet in this way, but most don’t tweet as much as me… Then again, it could also be that once in a while I retweet a normal tweet of someone known as a spammer, or any other reason. Not only is it a bit annoying; it’s even more annoying that you’re not sure as to why you seem to be blocked.